I made this for dinner tonight and it was delicious. I had a bunch of frozen peas, broccoli and cauliflower florets, which I used. It was super easy to make and DELICIOUS ! This was the first recipe I tried from skinnytaste and I could not be happier. I used macaroni noodles for the dish. 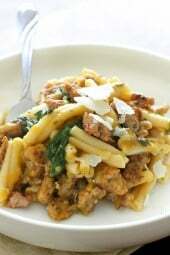 It came out so flavorful and remained delicious throughout the week as leftovers. The serving size is very satisfying. Thank you! I love this recipe. No creamy soups!! I thought I would adapt it to Chicken & Rice Casserole, using the liquids and veggies, but replacing the tuna and noodles with brown rice and shredded chicken. Thoughts anyone?? I lost the plot on this one! Despite following directions to a T, I had way too much liquid. The flavors didn’t really blend. Maybe I needed more Fat. “Spray a little more cooking spray and top and bake for about 25 minutes”. Please clarify…does “ and top” mean to cover the pan while baking? Also, to make this recipe a strictly “no meat” for Lent meal I replaced the chicken broth with a can of Bar Harbor Seafood Stock. Plus I added one can of chopped clams to the two cans of tuna. It was delicious. I want to double the recipe… what is the serving size? I see it says 1/6th in original recipe…..does that measure out to be a cup? First. This was a lot of work. I think prep took me about 45 minutes. It turned out well. I added garlic when I sautéed the onions and added 1/2 t dill and some parsley which gave it a nice twist. I sprinkled with Smokey paprika over the top ingredients to help with browning. There was no need to put under broiler. To cut carbs, I might use broccoli instead of peas next time and perhaps fried crispy onion rings on top instead of breadcrumbs. My partner suggested varied veggies and less noodles again to cut the carbs. I’ve made this a couple of times now. It’s quickly becoming a fav! Only modification I made was to use Marsala in place of sherry as that’s what I had, an extra can of albacore tuna and a generous pinch of red pepper flakes. Delish! It’s just hubby and I so it’s more than enough for second dinner or lunch. And I’m not a big tuna fan! Followed the recipe to the t – it was heavenly! Made this for dinner and really enjoyed it! Will keep this recipe and make again. Thanks! I made this tonight and was disappointed. Pretty blanned tasting . Don’t think I’d make it again. My family loved this. I have one question. Do you have the serving amount in cups? I’m on WW and wanted to know a more precise serving size.forvtracking. Thanks! I made this last night and my husband (who is tuna casserole lover) said it was delicious. We loved it, so much flavor without all canned soup yuckiness. 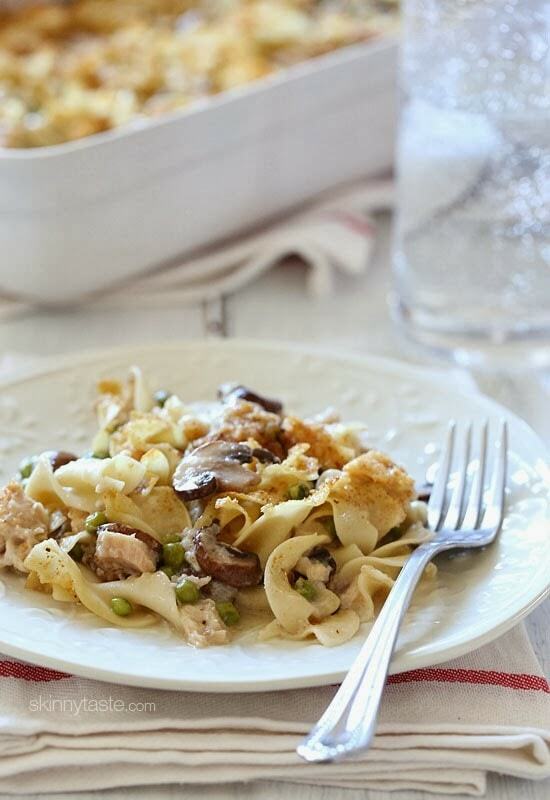 This will be my go to recipe for Tuna Noodle Casserole. The points were a great fit with my WW plan. Love this, thanks Gina you make staying on WW and being successful so easy. I have made this many times. It is delicious. So much better than using canned soup. I would be careful about Fat Free cheese – the ingredients (fillers, preservatives) are likely scary frankenfoods, and more than just cheese! You could use any brand that has real-food ingredients. Cabot is New England brand. It was a huge hit. Brought some to my mom (91 yrs old) and she would not share her leftovers with my sister……who came their to help her out. Made this tonight with no dairy! 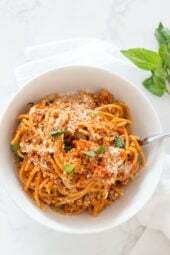 Delicious, followed the recipe almost to a T – I saw most people weren’t sure about how much dry pasta to use. I had a bag of egg noodles that was 16 oz. I used half the bag which was 8oz of dry pasta, perfect amount. 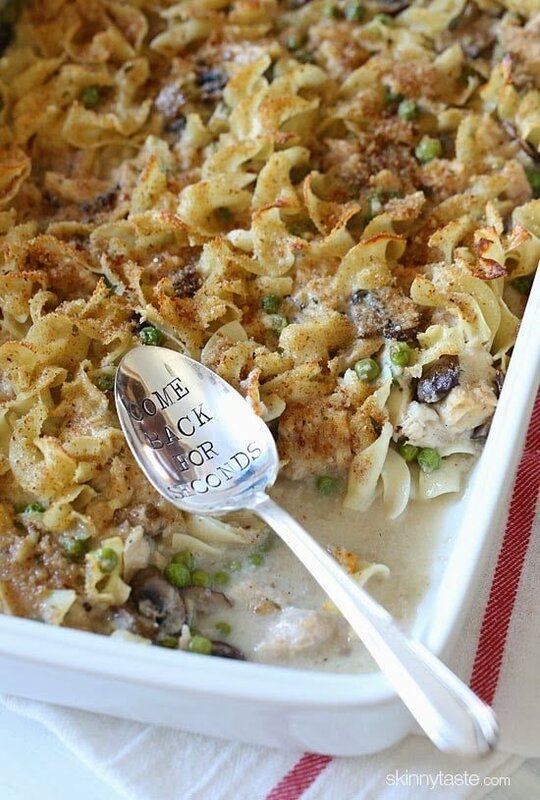 This is the BEST tuna casserole. This is very “steppy”, but it’s worth it. 10oz of mushrooms is very strong. We use about 1/2 and chop them to make it a kid-friendly meal. The family loves it. I’ve never made Tuna Noodle Casserole, but my husband said it was a staple in his house growing up. I misunderstood him, and thought that he had fond memories of it, but it turns out I was wrong. He was surprised when I made your version, but being a team player, was willing to give it a try. He loved it! My kids loved it, too, including my daughter, who we just discovered is no longer allergic to tuna. I’ll definitely be making this again. Thank you! Lol, glad it was a winner! This recipe is great for leftover Turkey. I love making this during the week with leftover chicken breasts. It’s also good vegetarian by adding more vegetables and using water, milk or vegetable broth. I would like to make this with my own shredded chicken. How much chicken do you think I’d need? Made this tonight and my husband and I both loved it!!! I have lived everything I ever made from you Gina!!!! This is the best tuna casserole I’ve ever had, hands down. My husband also loved it and asked that I make this one from now on. I have not made tuna noodle casserole since we found out my daughter had celiac disease 11 years ago! The canned soup has gluten. I was beyond excited to see this recipe and make it. And it did not disappoint! Thank you! Is the pasta measured cooked or dry? THanks! Fantastic recipe! I made this last night. It was super tasty and satisfying. I used more noodles and no Sherry. I also never used reduced fat or fat-free anything. If you’re gonna eat fattening comfort food, go all in or go home. Served with those really skinny string beans(chopped garlic and red pepper flakes).My mister asked me to put your casserole in the meal rotation. Thank you so much for this! Gina, I made this casserole this weekend, and I’m still raving about it. I’m passing on the recipe to my friends, especially those who have kids. This is so tasty, I can’t wait to make it again. Thank you, Gina, for this wonderful recipe! Be blessed!! ? What is the sodium content of the casserole? Thanks. Just made this and wow it is delicious!!! Great recipe. This was fabulous, my husband loves tuna casseroles, me not so much until now. What is the sodium content of the tuna casserole.?? Thanks. Planned on making this months ago but it never happend. Today I thought, what better time to make this dish than the first weekend of Fall! It was SO good! Tuna casserole was not one of my faves growing up, decided to give a try again with this receipe and could not be happier. Even my condesned-soup-loving extended family happily ate it, and agreed, it was delicious! This will be in my regular rotation….at least during the cooler/cold midwestern fall and winter. Made this tonight. It’s so good! Definetly a make again recipe. This is so good! Definitely going into the rotation! Made exactly as written with no substitutes! It also reheats well throughout the week! Am I supposed to cover it while it bakes in the oven? Thanks! Made this for dinner tonight, it came out great! My noodles came in an 8 oz bag, and I used 3 cans of tuna, a lb of mushrooms, 2 cups of peas, and a 5 oz bag of baby spinach. I increased the chicken broth and milk by about 1/2 cup each to make more sauce. I did use the sherry. My cheese was not reduced fat and I used 4 ounces. It filled a 13 x 9 casserole dish and easily made 8 servings. Really enjoyed the bumped up vegetables and the homemade mushroom soup. The sherry added that little something special. Didn’t broil the topping, but it was still great. Thanks for a great recipe! Going to make this for a gluten free family. I don’t cook gluten free, so I’m wondering what can I use in place of the seasoned breadcrumbs? Hi! I love all of your recipes!! Where is the serving spoon from?? Could this be made with canned chicken instead? It looks delicious but I’m not a huge tuna fan! This was amazing. I added a little hot sauce and lemon to the mixture before baking and it really put it over the top. My partner doesn’t eat tuna so I cut the recipe in half and it worked great (I did use the full tablespoon of butter and the three tablespoons of flour). I’ll never used canned mushroom soup again! It was so easy, delicious and healthier. Thanks! This was really good! I added smoked paprika, Italian seasoning, a dash of cayenne and an extra can of tuna! Definitely an awesome lighter sub for the heartier tuna noodle – love your recipies!! Well, this was absolutely amazing! I cooked and baked the whole thing in my big cast iron skillet, so the clean up was a breeze. Next time I think I will add some garlic when sauteing the onion. I do admit I added a bit more cheese (5oz instead of 4) and used full-fat milk and cheese. It was delish!! Thanks for the yummy recipe! Too much liquid to be thickened by three tablespoons of flour. Need to reduce chicken broth to one cup. Otherwise just okay. I was hyped to make this but it didn’t really do it for me. I cut back on the mushrooms quite a bit and even then it had such an intense mushroom flavor. My husband and I couldn’t really taste the sharp cheddar or tuna which was unfortunate. 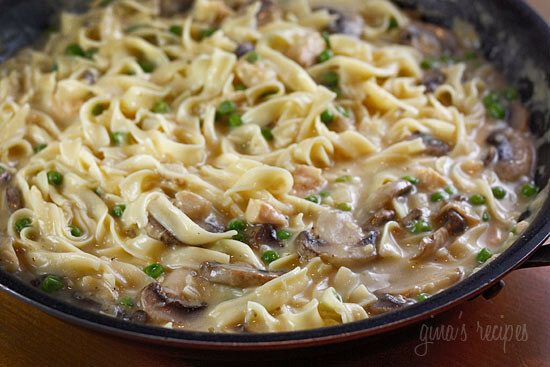 It’s probably just our personal preference but we may not make this again and if we did, I’d substitute mushrooms. I’m glad it’s a cheap dish as I don’t think we’ll eat the leftovers. LOVE this recipe. I have made it several times. My one note– when I made it the first time, the peas got overcooked. Now I throw in the peas after the cheese, just before cooking, to keep them from going mushy. I always add celery seed and celery salt, and a cup of sour cream. My topping is crushed corn flakes that i mixed with melted coconut oil. It’s a huge hit with the kids. One of my favourite recipes Thanks Gina. My husband loves tuna casserole and I most decidedly do not. Both of us agreed that this is something we want to add in our regular rotation. He asked that I use crushed potato chips instead of breadcrumbs in the future, because that is how his Mom always made it. Thanks for a great recipe. This was seriously good. My family loved it, kids included. We’re Catholic and I planned it for a Friday in Lent, not realizing the recipe contained chicken broth. I substituted vegetable broth that I had on hand and it was still delicious. Thank for for a wonderful update to the tuna noodle casserole of my youth. Please don’t stop being you and doing good for us! I just found you and I also just found out I’m diabetic and I feel sick all the time. I tried keto but Its just not a good long term fit for me! I’ve used multiple recipes of yours and I love your chicken parm recipe! I’m feeling good after eating your food!! And yes I’ve talked to my Dr about my nutritional needs so I’m on the right path as of now but you know I’m just sick of food and your meal plans are helping me take the thinking and worrying about my needs and no more boring, repetitive meals. I haven’t been over thinking food as much with your meal plans! And for that I thank you very much!! This recipe was not only tasty we appreciated that it was a lower calorie and lower sodium version and that used basic ingredients rather than canned soup. Thank you. Love this!! My mom loved it! I loved it!! So yummy! This recepie will be saved….Easy to make and delicious. Even my husband liked it. Super easy and delicious! my family loved it. My husband said we could add it to our rotation menu…I was so proud!!! LOL ☺Thanks Gina, I’ve made so many of your recipes and they all have been great! Love this! I haven’t made tuna casserole in a few years and when I did, I always made it with the condensed soup, which I never liked. Instead of peas, I used fresh green beans. It was delicious! I was afraid to use the broiler though, because I always end up setting off the fire alarm somehow. What am I missing? How long did you bake it? How many cups of dry pasta do you need? Hi also the recipe calls for 4 oz cheddar. 4 oz converts to half a cup but later on the recipe says use a cup of cheddar. Yup, 1 cup of cheddar will weigh 4oz. I believe your confusing the measurments with a liquid weight where in that case 8oz is a cup. Hope this helps! Can you clarify how much dry pasta to use? The recipe says 6 oz. Is this 6 oz of dry pasta or cooked pasta? I opened a bag of pasta that is 1.6 oz and it fills an 8 cup measuring cup. This amount (1.6 oz dry) already seems like too much. Do you have to use cheese? Could I used Greek yogurt instead? Is that ok to freeze? Really? Is there no way to just print the recipe? 22 pages of ads and comments and other garbage. I am NOT happy. There is a “PRINT” button just below the small picture on the recipe summary, you only get the recipe when printing. I don’t think you needed to give the recipe a low-ranking because of the print issue you had. 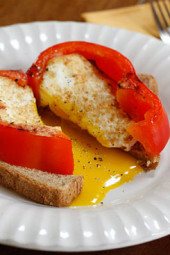 This is an awesome and healthy recipe – give it a try! Seriously you couldn’t figure out how to put in a different pan! Even the foil pans that are made in all different sizes and shapes.. 99cent store to the chain grocery stores carry these.. As for giving a low rating because you couldn’t print right is so not to put a rating like that.. Even old School pen and paper.. Silly person! I LOVED this recipe! I ended up freezing half of the recipe and it was just as good leftover. I have been looking for a recipe to make a homemade cream of mushroom and this one fit the mold and was super easy. I ended up adding a bag of spinach instead of peas, 16 oz sliced mushrooms, whole wheat elbow pasta, white wine instead of sherry (I didn’t have any) and made homemade whole wheat breadcrumbs on top! Great recipe! This is the best Tuna Noodle Casserole ever and even better that it’s a lighter version. I’ve had a hankering for this casserole for a while now but don’t cook with canned soups anymore so stumbling upon this recipe was just the thing I needed. Made the recipe as stated and LOVED it. I used 1 can green beans and 1 can corn. I used French fried onions instead of bread crumbs because I did not have bread crumbs. My husband can’t stop racing about it. One of our favorite recipes now. My husband and adult son and I think this is delish! I am looking forward to making it again in individual dishes for to-go meals. I used a whole wheat pasta? If so, which one would be good for this recipe? I meant can I use whole wheat pasta? Is there a way to make it this in my Instant Pot? Love this recipe! The bread crumb topping is so good. Husband also loved this. I love that it does not use canned mushroom soup. Can I use almond milk in place of the regular milk? Also can you use coconut oil in place of the butter? This is delicious! I love being able to control the sodium and not have to use the chemical tasting canned soup. My husband liked it too! Really good dish. My husband and I enjoyed it and are having leftovers tonight! Made this casserole for the first time a couple of nights ago. It was fantastic! I used chickpea pasta and substituted white wine for the sherry because it’s all I had, Oh, and some Pepperidge Farm herb stuffing left over from Thanksgiving instead of bread crumbs. It was insanely good. Thanks, Gina! Hi!!! This is one of my favorite recipes ever…. Did the points change with freestyle? Thanks Gina! SP have been updated to reflect the freestyle program. We loved it!! Used without sherry and mushrooms for personal preference. I would recommend light dusting on the breadcrumbs for nice crunch (we used a bit too much) we used lactose free milk and cheese in the recipe and turned out delicious!! Next time we may add more tuna since we took out the mushrooms. Thanks! Made with the no yolks noodles and used skim milk. It is excellent!!! My husband raved about it! Better than the soup version! This recipe is outstanding! I didn’t have sherry on hand but it was still delicious! I chopped up the mushrooms into tiny pieces so my son wouldn’t notice them and he didn’t. My whole family loved this recipe. It’s a keeper! Could I subsitute the chedder with 4 cheese mexican cheese? I have made this a few times and my daughter and I love it. My husband really doesn’t like the peas. So I made it tonight without the peas and threw in 3 cups of baby spinach at the end, just until it wilted. Instead of putting it in the oven, we took it straight from the skillet to the plate. My husband had seconds! In ingredients it says 4ozs of cheddar and in description it says 1 cup? It’s 4 ounces (weight) which is 1 cup. Do you HAVE to freeze the make ahead version? Can I whip this up to the point of baking then keep it in the fridge a few days until I’m ready to bake it off for dinner? I made this last night and we both loved it! It keeps the best of the traditional recipe, but it’s loaded with fresh mushrooms and has homemade sauce instead of gross canned mushroom soup. Even if it wasn’t a lighter version of the original, it would still be an improvement! Definitely a keeper.